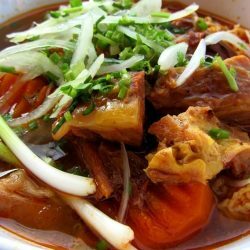 One of my favourite dishes in Vietnam, bò kho (beef stew) is a hearty, spicy and aromatic broth with diced beef, carrot and lemongrass. 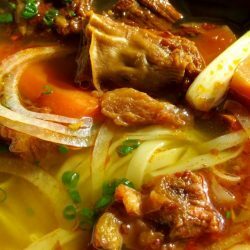 Bò kho can be eaten on its own with a warm baguette for dunking or served over noodles, and is almost always accompanied by half a dozen types of fresh herb. The cooking process is long and complex so a really good bowl of bò kho is rare, but when you find one there’s nothing quite like it. The base of a good bò kho is as complex and exciting as an Indian curry paste. 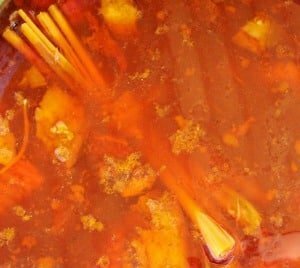 Star anise, cinnamon, red chilli, cloves, black pepper, garlic, shallots, ginger and even nutmeg, turmeric and fennel seeds can all be used to create the rich and spicy foundation of this stew. Many cooks will simply use an off-the-shelf ‘bò kho powder’, but the result is still an intense and intricate broth. Slow-cooked beef and beef bones add body to the spices. Then there’s lemongrass; lots of it! 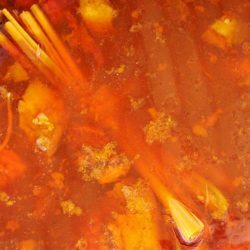 In every great cauldron of bubbling bò kho you’ll see dozens of splintered sticks of lemongrass bobbing up and down in the amber broth. 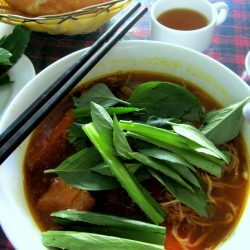 The lemongrass cuts the rich, deep flavours of the spices and the meat, and gives the soup a light and citrusy balance. 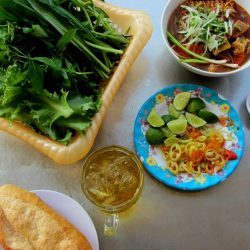 This balance is typical of Vietnamese cuisine, and for me it’s what sets bò kho apart from the curries of the Indian Subcontinent (which are heavier and richer than bò kho), and from the similarly spiced dishes of the Malay Peninsular and Indonesia (which have more heat to them than bò kho). Being someone who prefers the smell of fresh chilli to the taste of it, bò kho suits me perfectly: all the flavours and fragrances from the spices are present in the broth but the heat is tempered and cooled by the lemongrass. Having said that, I have had some extremely firey bowls of bò kho, especially in rural areas. 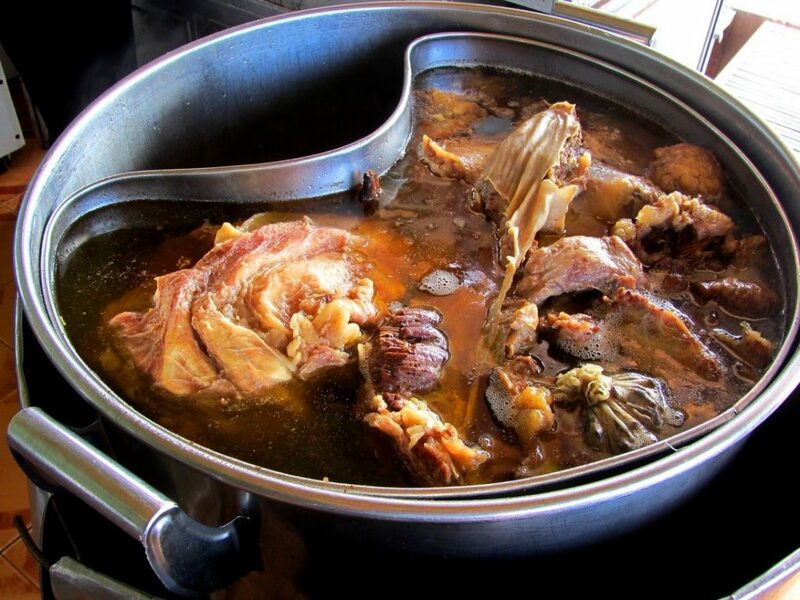 Like so many Vietnamese dishes, no one can agree on the origins of bò kho. However, there are lots of possible influences, from both East and West. 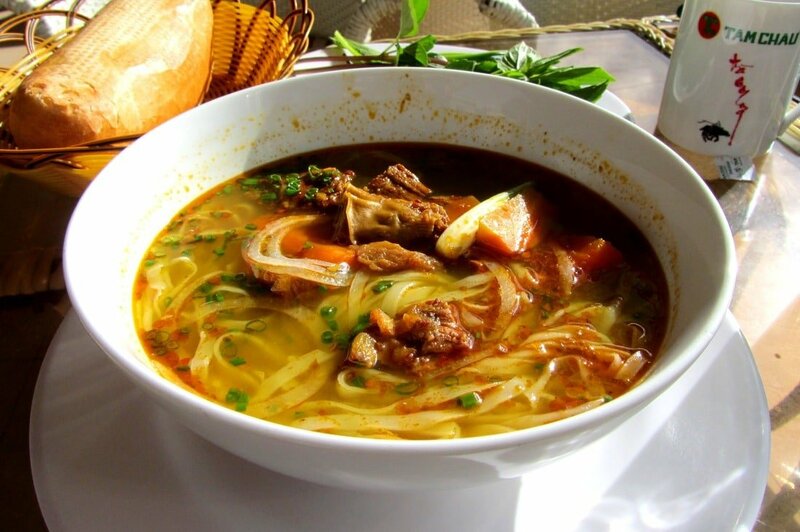 The amount and kind of spices used in bò kho are quite unusual in most other Vietnamese broths. 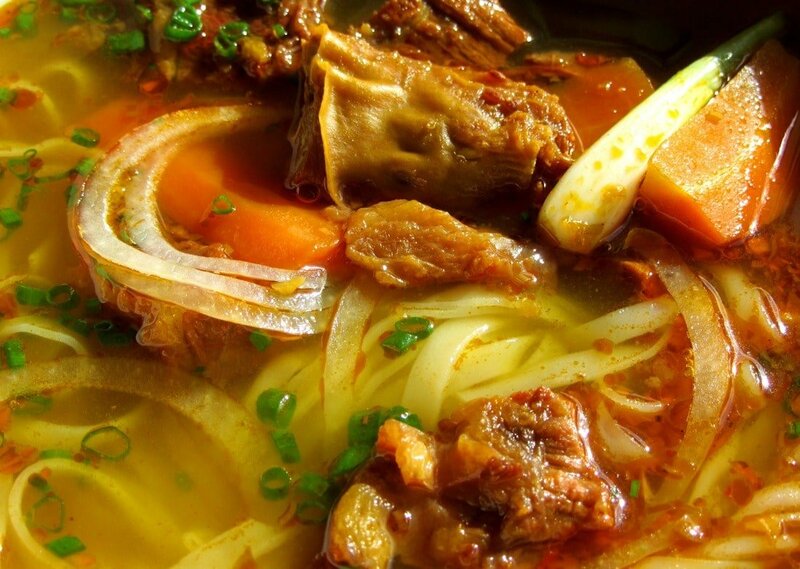 If you’ve been eating local soups in Vietnam for a while and then have your first spoonful of bò kho, you’ll likely think you’ve stepped into a Malay, Indonesian or Indian restaurant by mistake. 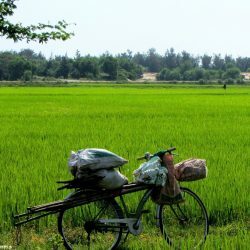 Many of the spicier dishes in Vietnam are thought to be part of the legacy of the Chàm civilization – a Hindu, Indianized culture that thrived in central Vietnam over a thousand years ago. Vietnam was also a stop on the old maritime spice route; when boats plied between China, India and the Middle East before continuing to Europe. 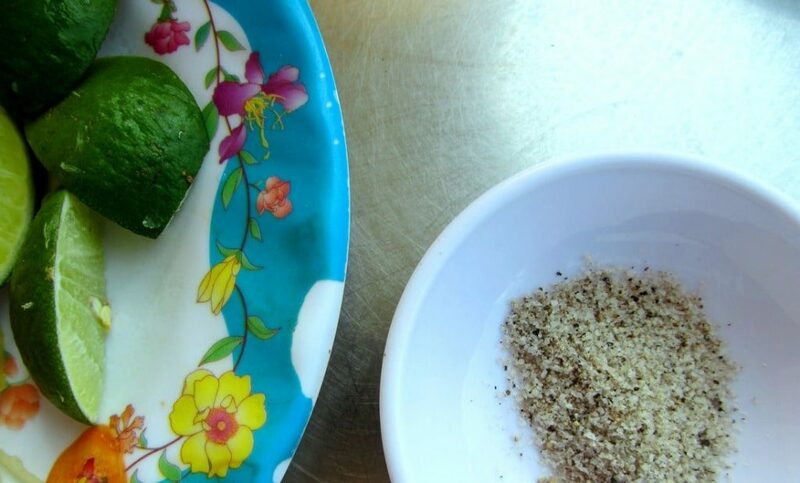 This often had an impact on local cuisine in trading towns, such as Hội An on the central coast, where sailors and merchants (who sometimes had to wait months for favourable winds) would try to recreate dishes from their native countries. 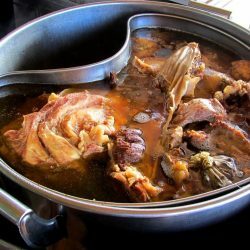 Another influence on bò kho might have come from northern Europe, where slow-cooked, warming and hearty stews are common. The French, who effectively ruled Vietnam from the late 19th century to 1954, introduced beef to the Vietnamese diet (previously cattle were seen as working animals and therefore too valuable to consume). So it seems likely that the French – who have some very famous beef stews of their own – had a part to play in the creation of bò kho. Ultimately, as with many Vietnamese dishes, I suspect bò kho is the product of many foreign and native influences that eventually came together to create another great Vietnamese soup. 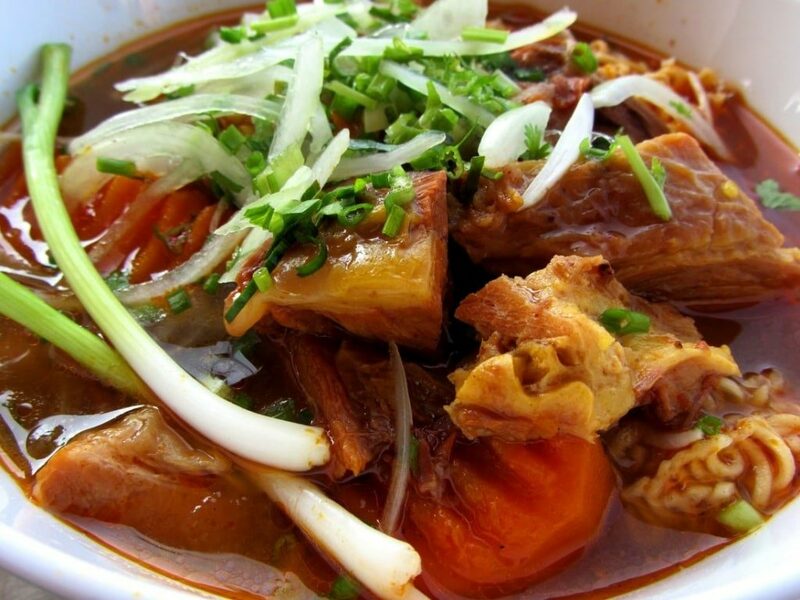 Bò kho is usually eaten for breakfast, but is available throughout the day in many places. A heavy, spicy, meat stew at the start of the day seems like an odd idea, but such is the balance of rich and light flavours, and the combination of intense spices and tangy lemongrass that it’s more likely to wake you up than weigh you down. Beef stew on its own (bò kho không) makes for a very light and simple breakfast. 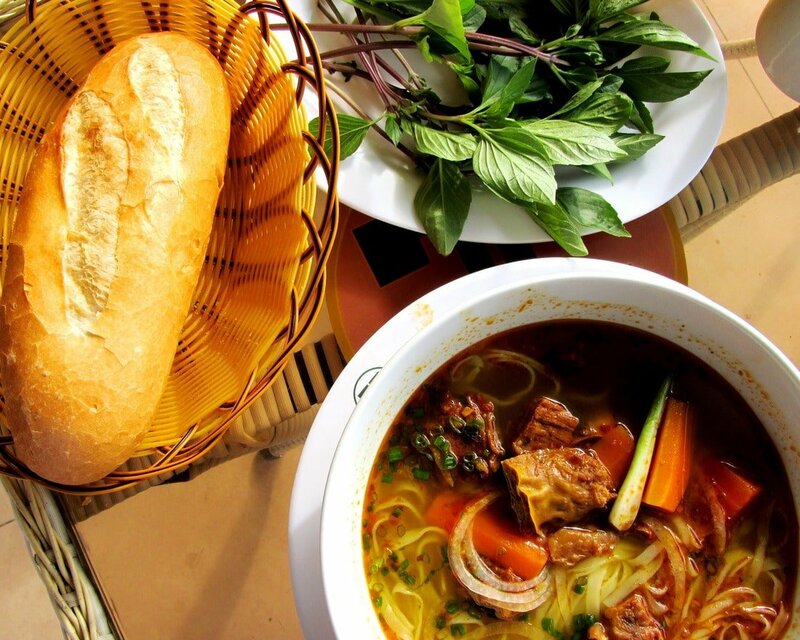 Add a baguette (bánh mì bò kho) for soaking up all the delicious broth – another French influence. 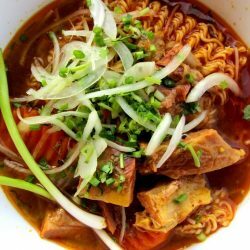 Beef stew with yellow noodles (mì bò kho) is the most filling combination: the noodles will either be fresh (mì tươi) or instant (mì gói) – strangely, I prefer the instant variety with my bò kho. 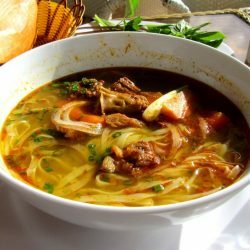 Beef stew with white rice noodles (phở bò kho) or vermicelli (hủ tiếu bò kho) are both popular, although in my opinion these white noodle varieties ‘clash’ with the amber broth – I always choose yellow noodles for aesthetic appeal if nothing else! Once you’ve chosen your preferred combination you can then garnish the stew with sliced red chilli, herbs and a squeeze of lime. The chilli (ớt) will add some heat if the stew is too mild. 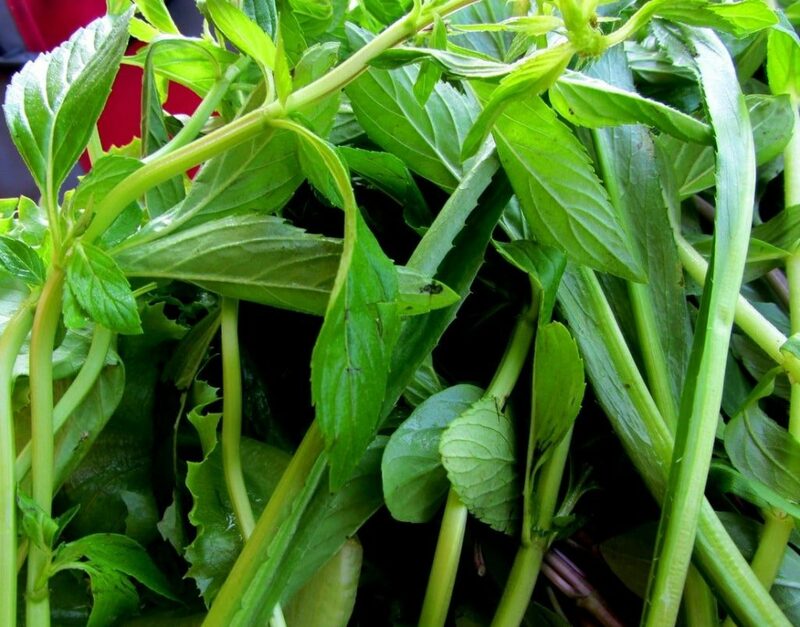 The herbs (rau thơm) introduce even more complexity to the broth and also add great colour and texture. 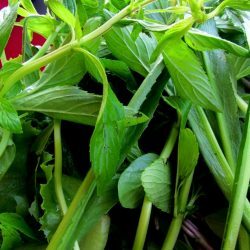 There are usually a few herb varieties to choose from; my favourites are basil, sawtooth coriander (more for crunch than flavour), rice paddy herb (an aniseed-like taste that works really well with the spices in bò kho) and mint. I tend to squeeze a lot of lime on my stew because it cuts the heat and complements the lemongrass. 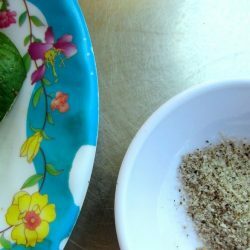 One other accompaniment that you’ll find is a tiny dish of salt, pepper and lime (muối tiêu chanh). Mix these together and dip the chunks of beef from the stew in it. I’m not sure of the origins of this simple little dip, but Vietnamese always use it with beef or seafood and it completely transforms anything that touches it! Unlike other popular Vietnamese dishes, very few places specialize only in bò kho. 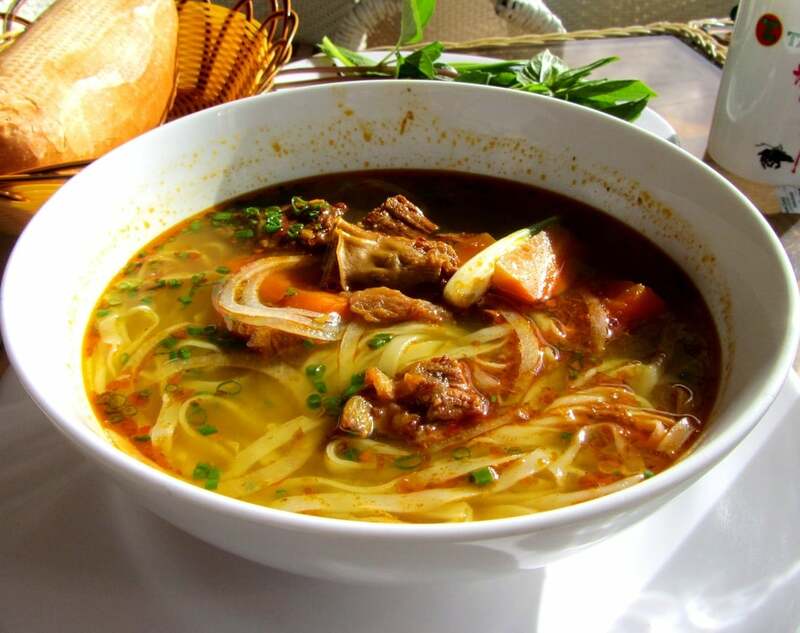 Instead it is usually sold in soup houses that serve phở – the ubiquitous beef noodle soup that’s as close as Vietnam gets to a national dish. Look out for big signs advertising ‘PHỞ’ and there will often be a smaller sign next to it saying ‘BÒ KHO’. 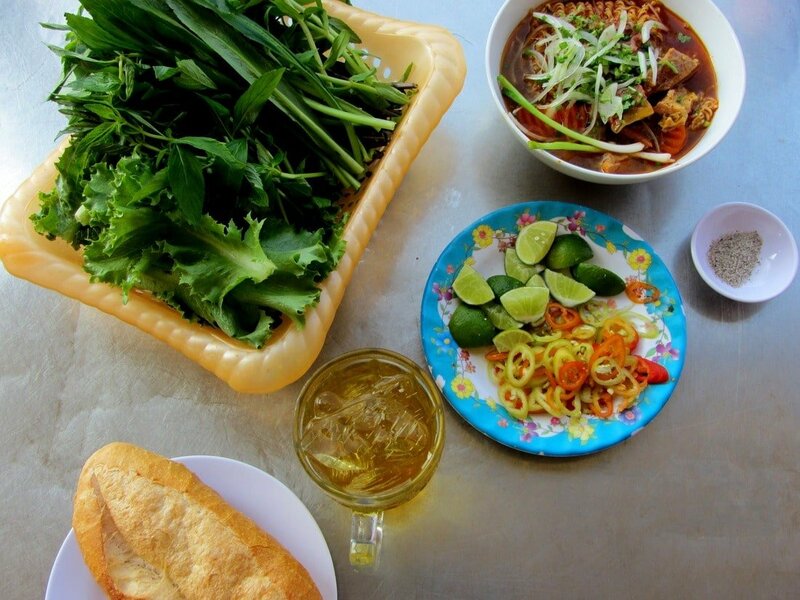 As always, don’t judge a place by its outward appearance: some of the best soups in Vietnam are found in the grubbiest looking eateries in the roughest parts of the country. Of course, this isn’t always the case, and bò kho in particular is a dish that needs to be of a certain standard to enjoy. For this reason, I’ve only listed a few places under Locations and some of them are in seldom-visited areas. However, it’s always worth trying bò kho when it’s available, especially if you’re bored of having phở for breakfast every day. 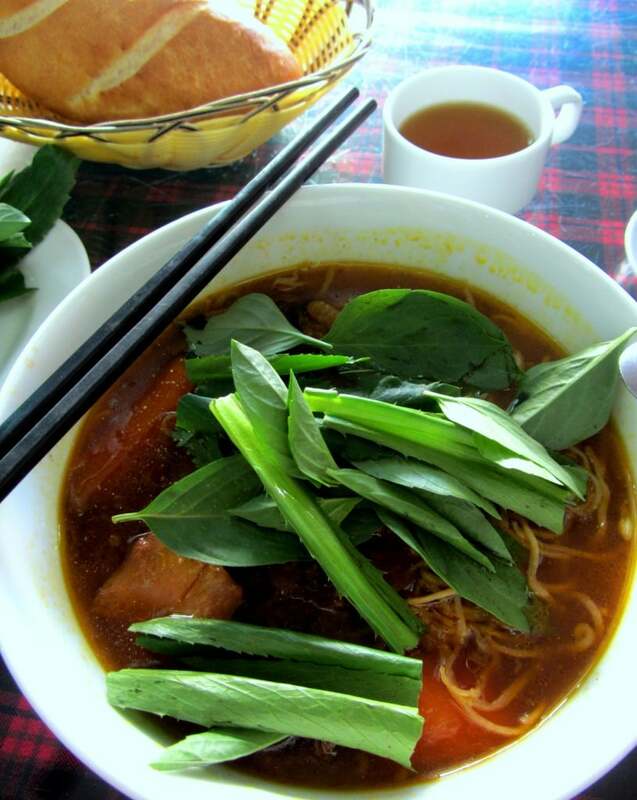 (If you have a favourite place for bò kho anywhere in Vietnam then please let know – I’d love to try it). This is my favourite place for bò kho in Vietnam. 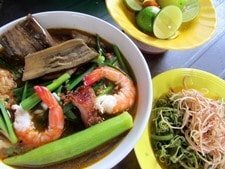 Located in the small but busy fishing town of Lagi on the Ocean Road (200km east of Saigon), bò kho has been served here by the same family for three generations. 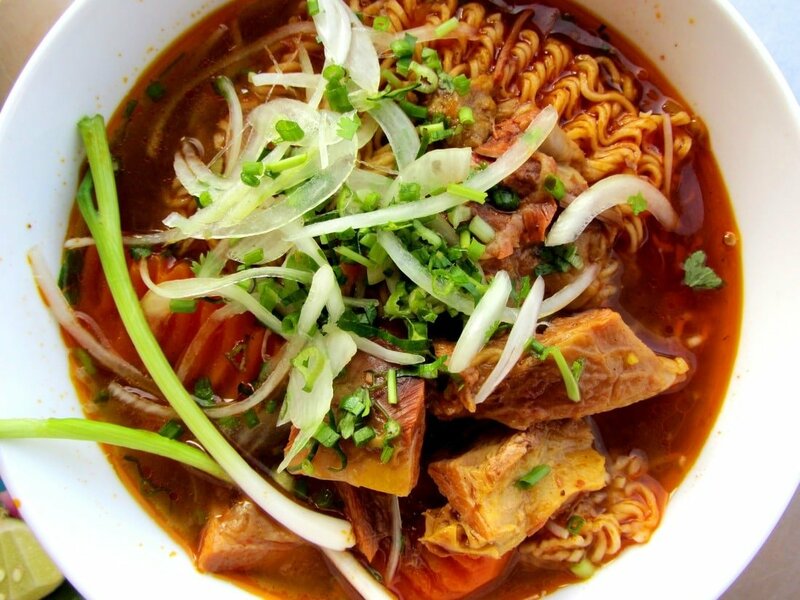 The bò kho is rich, spicy, punchy and warming. 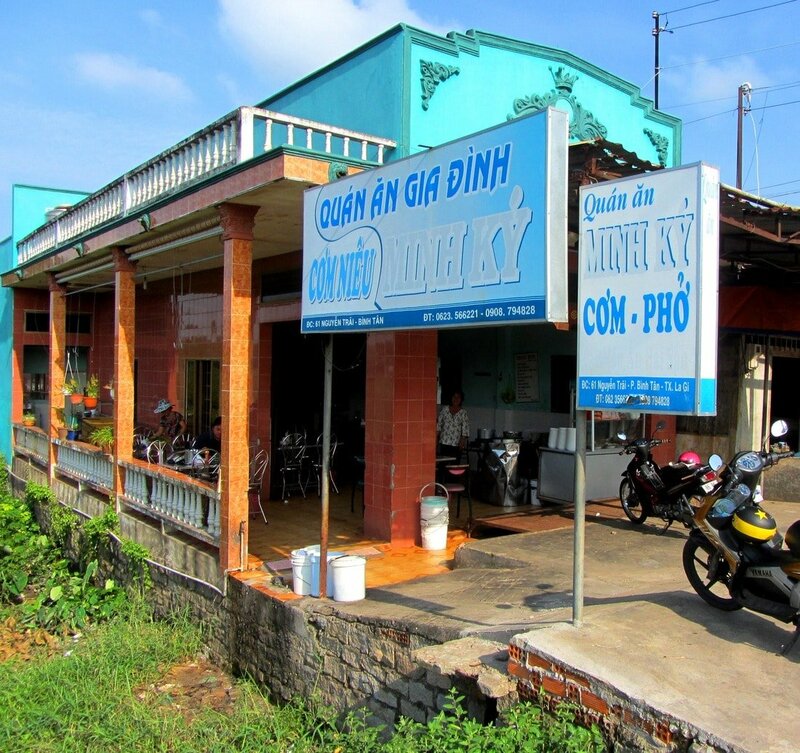 This soup house is named after Madam Minh Ký who is the owner and chef. 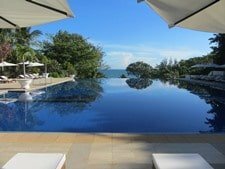 She is very welcoming and points out that she’s not the only cook in the family: her son studied cooking abroad and is now a chef at a high-end resort on Mũi Né beach. Quán Ăn Minh Ký specializes in phở and the sign outside doesn’t even mention bò kho! Only one pan of beef stew is made each day, so get here early: most customers have finished by 8am. 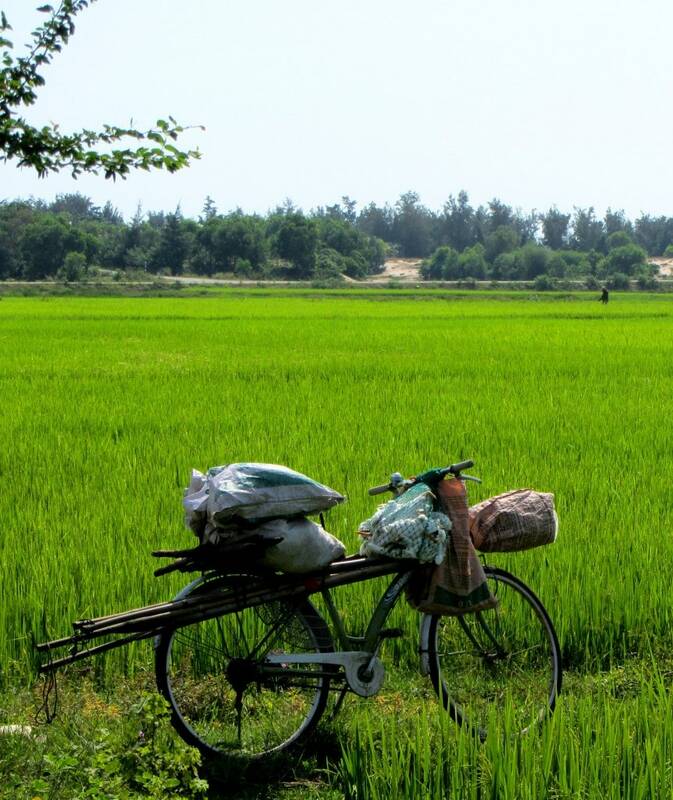 Lagi is a likable but dusty town surrounded by green rice fields and long, empty beaches. Quán Ăn Minh Ký is located between the beach and the town: (if coming from the direction of the beach it’s on your right about a 100 metres before the bridge). This is one of those places where both the food and the physical surrounds are part of the experience. 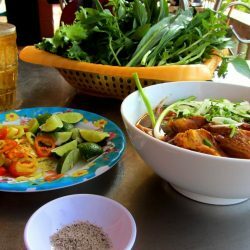 Minh Ký soup house is an unassuming building with some outside seating on a veranda looking over herb gardens, small fishing holes and roaming cattle. A bowl of beef stew in the bright early sunlight with a strong iced coffee is, for me, the perfect morning. Sadly, the green patch of land next to Minh Ký has recently been covered in concrete and fenced off for the construction of a new residential area. They’ll be no more gazing over green fields and grazing cows in the cool mornings here, but at least the bò kho will remain the same. 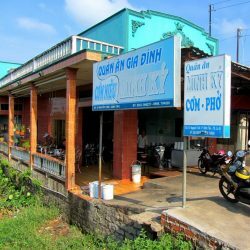 As the name suggests this is another place that serves mainly phở, but the bò kho is also very popular here. Phở Quỳnh is a small chain that pops up in a few locations across Saigon. The Phạm Ngũ Lão store is the best-located for most travellers as it is right in the heart of the backpacker area. I usually dislike ‘chain’ versions of classic Vietnamese street food, but the bò kho here is good, thick and meaty, although the broth isn’t quite as exciting as it could be. 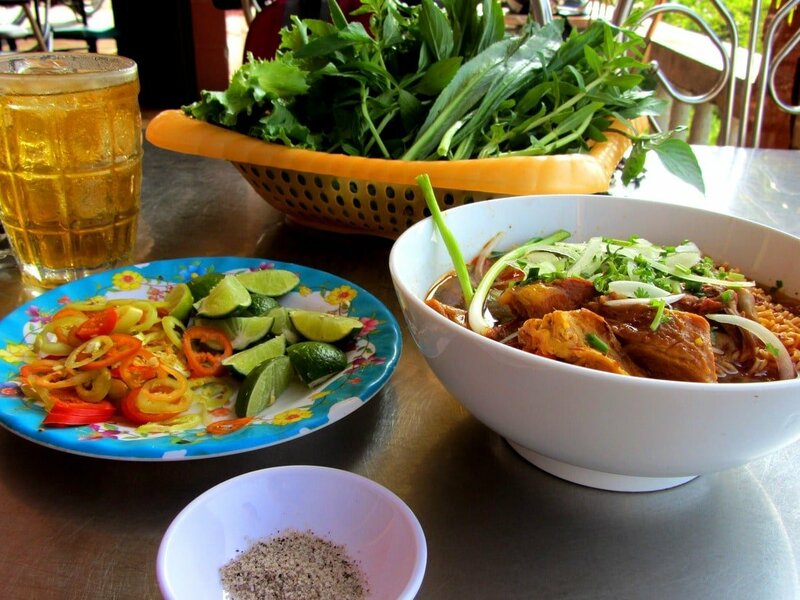 Phở Quỳnh is always busy with locals and tourists – so they must be doing something right. Located in Dalat city in Vietnam’s Central Highlands, Liên Hoa has a famous bakery downstairs and a decent restaurant upstairs. The bò kho here is pretty good but a bit mild. What makes it stand out is that the baguettes are served warm and crusty because they are baked on the premises, the meat is tender and the noodles here are fresh (not instant). 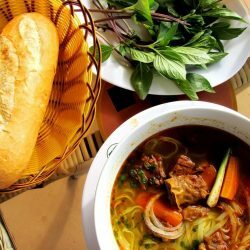 Dalat’s mountain climate – which is much cooler than lowland areas – is perfectly suited to bò kho: a hot, meaty stew and fresh warm bread in cold weather is a great combination and one that most people wouldn’t associate with tropical Vietnam. Seating is inside on the first floor and there’s a big thermos of artichoke tea on each table – which Dalat is famous for. 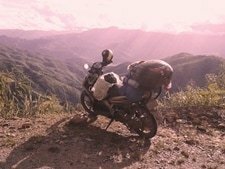 Tâm Châu Café is in the small mountain town of Di Linh, which is 80km south of Dalat on the main Saigon-Dalat road, Highway 20. The bò kho here is very colourful and well-presented but a little too watery. 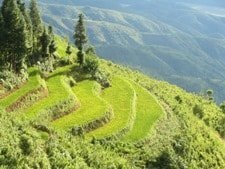 Tâm Châu (www.tamchau.com) is the name of a massive Vietnamese tea and coffee company which owns a large plantation in the area. As you’d expect the tea and coffee here are very good and make a great accompaniment to the bò kho: Try a pot of hot oolong tea (trà ô long) which means ‘black dragon’. The Tâm Châu Café looks like a convenience store from the outside, but it’s quite pleasant sitting out on the veranda in the early mornings or evenings when it’s popular with young locals. Like Dalat, Di Linh has a cool climate which makes a bowl of hearty stew and a pot of hot tea very comforting. 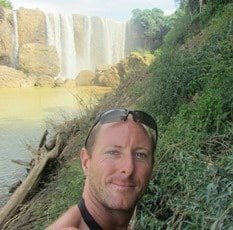 This entry was posted in ALL, FOOD & DRINK, Noodles, Soups, Street Food and tagged beef stew, bò kho, food, guide, soup, street food, travel, Vietnam. Bookmark the permalink. Mate I just had the bo ko and it was great, right after the fish markets- great start to the day. Now off to the beach. Thanks for the tip. That’s good to hear. It’s a great dish. Enjoy the beach! I just had Bo Kho this morning and it was sooooo good. A prefect dish for breakfast. By far the best breakfast I had. Yes, it’s a great dish! I just had a good bowl of bò kho yesterday too, in the Central Highlands. 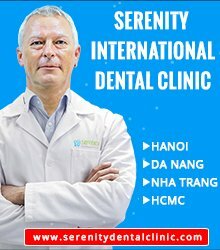 If you want the address for that place it’s on the Vietnam Coracle Facebook page. I hope you find more good food on your travels.